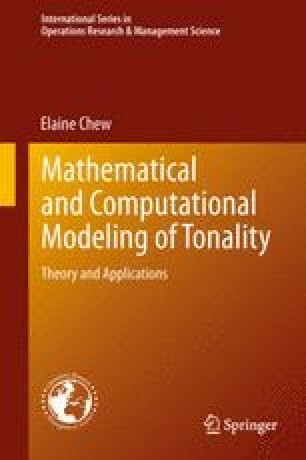 In this chapter, I compare the performance of the Center of Effect Generator (CEG) key-finding method, based on the Spiral Array model, to that of two classic key-finding algorithms, namely, Krumhansl and Schmuckler’s Probe Tone Profile Method (PTPM), and Longuet-Higgins and Steedman’s Shape Matching Algorithm (SMA). The three algorithms are tested using the fugue subjects of Bach’s Well-Tempered Clavier; the evaluation criterion being the number of pitch events needed to correctly determine the key of the fugue. The CEG required on average 3.75 pitches, the PTPM 5.25, and the SMA 8.71. If one considered only the fugue subjects in which the tonic-dominant rule was not applied by any of the three algorithms, the CEG required 3.57 pitches, the PTPM 4.79, and the SMA 8.21. The MATLAB code and details of each test run are given in Appendix B. Here, I present an analysis of the results of the comparison, and discuss the issue of model validation. A MATLAB version of the CEG code appears in Appendix B. The CEG method is applied to polyphonic music in MIDI (Musical Instrument Digital Interface) format in Chap. 9, and adapted to music audio in Chap. 11.